WordPress is an open-source content management system with a secure core and large support community with nearly 60% of the market share for content systems; the closest competitor is Joomla at 6.3%. A large portion of that market is made up of enterprise users, like Visa, Disney, and Time Inc. and as a result, new enterprise WordPress plugins are constantly being developed to streamline processes for large brands. With over 47,000 plugins available, this post will help you cut through the clutter and is a great follow on to 5 key elements to a successful enterprise WordPress site. We are here to talk about the top WordPress plugins for enterprise business sites in 2019. To narrow the prospects, we concentrate on plugins for security, SEO, and performance optimization. Malware attacks continue to make headlines; the most recent is about hackers who take information for ransom. Hackers have been a factor in the last presidential race and continue to wreak havoc as our lives migrate online. Security is a big deal and requires more attention than we’ve been paying to it. Here are three security plugins to handle different areas of vulnerability and give you back control of your website. Plus, 3 simple WordPress security tips here. Akismet is the most downloaded WordPress security plugin out there. It is an anti-spam application developed to allow you to approve, trash, and report comments as spam and prevent your website from being overloaded with spammy comments. When you have too many comments, your website performance suffers. Spammy comments rarely add anything of value to the conversation. The Enterprise version is $50/month for unlimited websites. Akismet premium includes advanced statistics and priority support. Sucuri protects against almost any online attack. It includes a content delivery network and adds Layer 7 DDoS protection. Available additions to the monthly subscriptions include security monitoring and malware detection and cleanup. The Business version is about $42 per month per site and provides security scanning and brand reputation monitoring every 30 minutes and quick response for malware and hack repair, blacklisting warning removal. Checks for the IP address of any website being used for spam. Password auditing is a critical element of securing your website. This feature helps users develop strong passwords that are less likely to be cracked. Your website is only as safe as your users allow it to be; password auditing lets you find user passwords that are already known by the hacker community and which accounts are using easily guessed passwords. WordFence is highly flexible and allows you to block a range of IP addresses, specific browsers, and web browser patterns. A premium license maxes out at $8.25 per month, and they offer volume discounts. Once your site is secured, you can turn your attention to optimizing your site for search engines and perform an SEO audit on your website; here’s how to do that. There are several steps to creating an SEO friendly page and the following plugins prompt you to perform the right steps and can help you determine the best options. Yoast SEO began as SEO for WordPress by Yoast; it is the number one downloaded plugin for the platform. It’s bulging with features to up your SEO game along with prompting you to determine and place a focus keyword in the relevant areas for every content piece. Yoast SEO helps users toward what it calls sustainable SEO by improving text and image setup for better search engine usability and visibility. The premium version is sold as an annual subscription with tiered per-site pricing for multiple sites. A single site is $69 for one year of updates and support which comes down to about $5.75 per month. Once downloaded, The SEO Framework places a display bar next to posts and pages so you can see the SEO status of each at a glance. The SEO Framework is a free download. If you wish to purchase the extension manager, it starts at $30 per month for their business version which supports up to 50 sites. It isn’t enough for search engines to find your website, your site must perform brilliantly, or your visitor will jump ship. Is your site slow? Here’s what to do. You need your pages to load quickly and flawlessly, which is where the next set of plugins shines. Freely available from the WordPress site, WP Smush provides image compression to optimize image load time without sacrificing quality. It optimizes all images in JPEG, GIF, and PNG formats and saves you a ton of storage space. WP Smush will “auto-smush” attachments upon upload, and you can manually smush attachments in your media library. There is also Bulk Data Smush that compresses up to 50 attachments at once. Jetpack also enhances distribution to automatically share published content to third party services including search engines. It helps your site increase its reach and traffic volume while preventing brute force hack attacks. Also, it creates a sitemap so search engines can easily index your site. One nice feature is that it monitors your site every five minutes for downtime issues and immediately notifies you when something goes wrong. The premium package is about $3.50 per month and provides spam filtering, backup, archiving, and premium support. WordPress is the most popular and well-established content management system on the internet today with a healthy economy of businesses, developers and plugin creators all working together to keep the ecosystem running smoothly. It is used for personal blogs all the way up to enterprise content management. New plugins are developed every day, but we think these will give you the most bang for your enterprise buck. 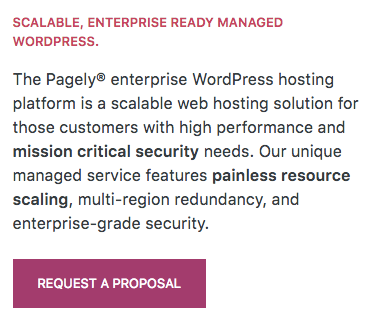 Pagely is The World’s Most Scalable Enterprise Solution For WordPress. Nicole Letendre is the marketing coordinator for gobonafide.com, a digital marketing agency in Houston, Texas. She loves writing, social media and keeping up with the latest marketing trends. Hey, Nicole. Thanks for sharing. I want to suggest you one more plugin for security enhancements which is User Activity Log Pro. You can monitor and keep track of all the activities occurs on the admin side with this plugin. It provides a very easy user interface to manage your site’s user roles. To me, NinjaFirewall (WP Edition) is the best security plugin for WordPress. Integrates into the site as deep as php.ini, monitors changes in file system, closes known backdoors and has many many other handy tools which make any WP site rock-solid in terms of security. At least in my case it helped to get rid of attacks entirely on several websites. A must have. I’d like to suggest also SeoSamba’s Enterprise WordPress SEO plugin to this list. It let you optimize any size WP site from a rule based engine. There’s also use an auto-optimization feature that optimize content as it gets created. You can also go back to previous versions your optimized site. A life-saver for large installs or multiple sites owners. There’s a free version too.